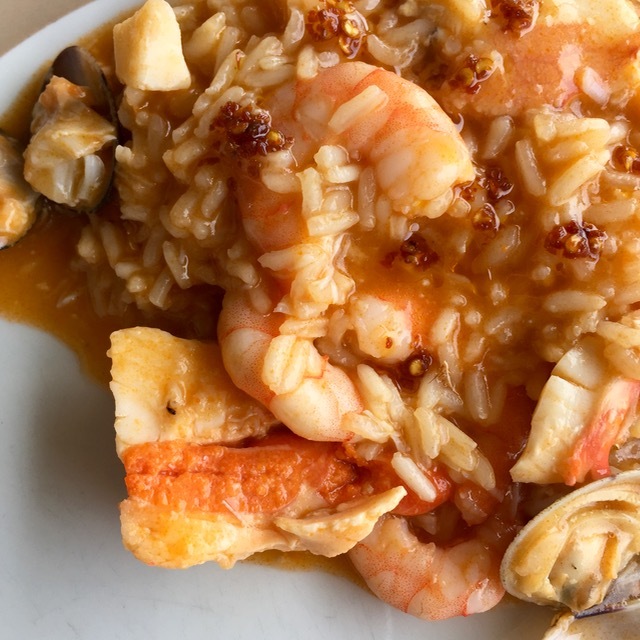 One of the most memorable dishes we enjoyed on our trip to Portugal last year was this gorgeous arroz de mariscos (dotted with piri-piri sauce), at a seaside restaurant in the town of Cascais. We were hungry, the view was phenomenal, and the dish was just brilliant. I would never have guessed that a relatively simple sounding soupy rice dish (though redolent with the best of catch of the sea when it arrived at our table) would figure as one of my all-time trip favorites. I had looked up various recipes, none of which would seem to yield what I was looking for, and in fact my first attempt at the dish was a bust. So this time around, I decided to just go with my instincts. First, I made two broths… one with bisugo (red mullet) and aromatics for a flavorful fish broth. Next, I made a shrimp broth. But not just shells thrown into a pot of water and boiled. 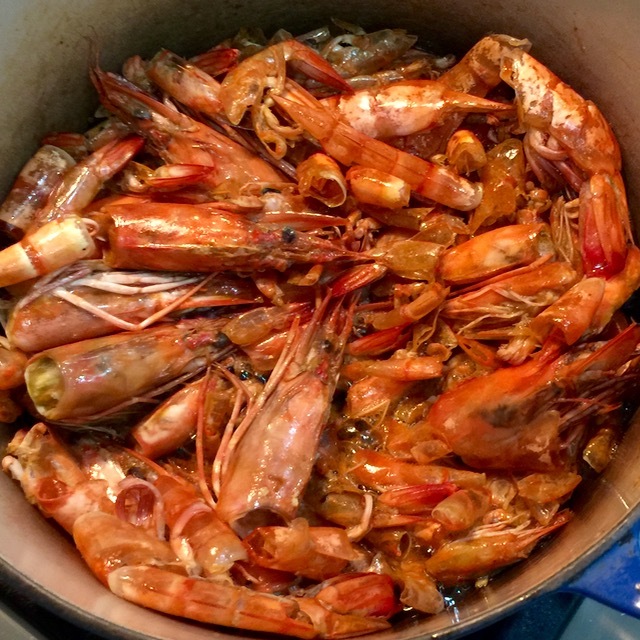 Here, I sautéed shrimp shells and heads in some butter, then deglazed the pot with some white wine and after the alcohol had burned off, added water to make one of the best looking and tasting shrimp broths I have made in recent memory. I used a chinois (no, that’s not a person, silly) to strain the solids out. The broth/s are ESSENTIAL to this dish, and if you don’t make them from scratch or with great care, I think you are making a mistake. I suspect for the restaurant’s version, they had a nice mixed seafood/shellfish broth from all the trimmings in the kitchen. 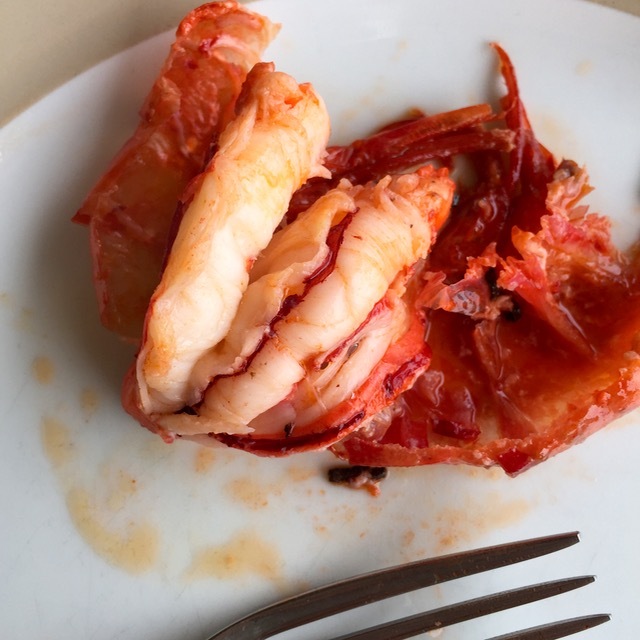 Another favorite from that Portugal trip were these amazingly bright red (prior to cooking and also after cooking) shrimp/prawns that were done so simply with just olive oil and garlic. That arroz de mariscos looks like the lovechild of your seafood paella and my favorite lugaw from my favorite lugawan. I mean that in a good way! Even if the weather has been searing hot lately, I am MOST tempted to make that this weekend. Yesterday the market was FULL of seafood. I was surprised, as I expected people would be all seafood-ed out after the long weekend. What was the situation at the Nasugbu market over the long vacation, MM? OMG, my mouth is watering! Looks soooo delicious as usual. 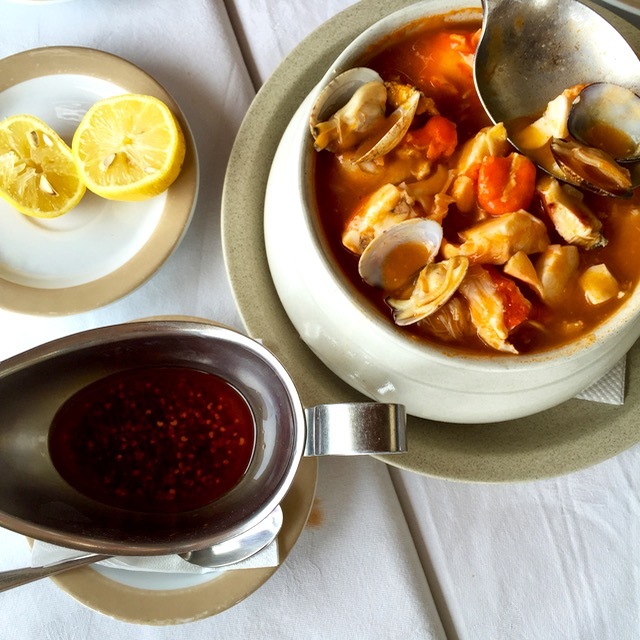 Yes, I always make my shrimp broth like yours – – I actually have some in the freezer and since it is raining here I will make some of this arros de mariscos. Thank you. Loved, loved Portugal… IMO, one of those underrated Euro countries that is why it took us a while to visit (last Nov.). One of our fav countries: unbelievably delicious but simple food at reasonable price + amazing Douro wine. Can’t forget the suckling pig, various sausages/cheeses, and seafoods galore. There’s a well-known rest. 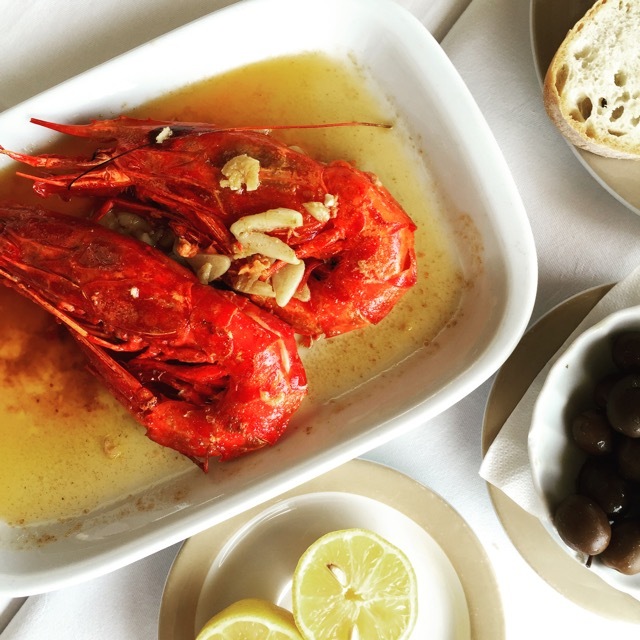 in Lisbon where depending on the seafoods you choose, the rest. just cook it ONLY one way… line was always long anytime. You were in Portugal and no report on the legendary Pasteis de Belem?, or Tripe à la mode de Porto and I can understand none either on the leitão on the way to Coimbra. Never mind, this, Arroz de Mariscos, yumm, redeems everything. 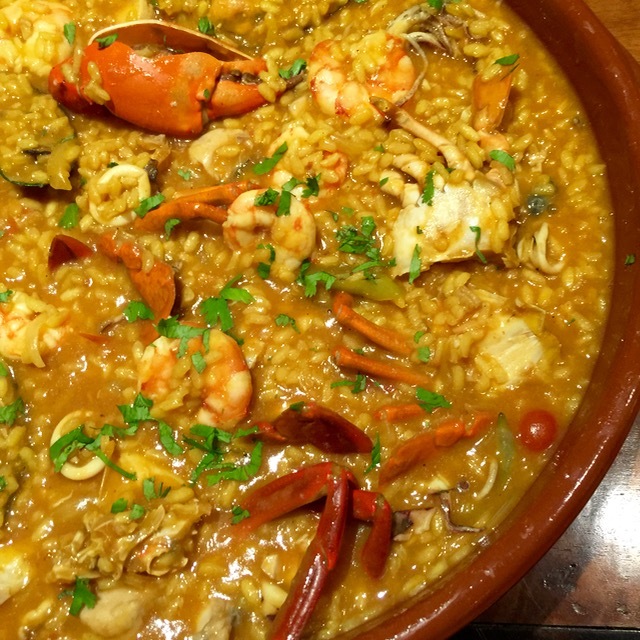 We already know from Paella or our own Pancit Malabon that the marriage of rice and seafood works but did you know that lobster or crab bisque is traditionally thickened with rice? A hundred yes to this and a final no to risotto. Time and again I order it not having learned a lesson from the previous time and time and again it arrives to my table underdone, hindi inin. Perhaps I’m just unlucky with this one dish. I ordered a prawn risotto once at the Oyster Bar in the bowels of Grand Central Station and I thought they finally nailed it. Ordered it another time, back to disappointment. Al dente rice is not a concept acceptable to this self-respecting Asian. “This version was reach and delicious…” MM, I think you meant rich? I’ve been to Portugal twice (though only a few days each time) but I can’t recall any memorable meals I’ve had while in the country. Maybe my memories were upstaged by the meals I had in its neighbor, Spain. Our biggest regret was not having the egg tarts in Pasteis de Belem. We didn’t know that it was just beside Jeronimos Monastery which we spent hours in. It is the word processor spelling rascal. Oh pastel de nata… I must have gained 5 lbs. just from eating it; we happened to be staying at an apt. half a block from a bakery (Manteigaria, Bairo Alto) and it became a habit to have two of these + café pingado (espresso with drop of milk) for just E2.67 every morning, snack and after dinner. Thought they were better than Belem’s. The place only bakes tarts and there was no table; just 1 long counter but was always packed anytime of the day and night. They ring a bell loudly (a century old habit) to announce that a fresh tray just comes out of the oven! Now here in the US whenever we have a craving we drive to Texeira Bakery in Newark where lots of Portuguese live. A 1.5 hour flt. from Lisbon is Madeira (an autonomous region of Portugal) where one can have tropical fruits like what we have in ‘Pinas…atis on steroid, very sweet tiny bananas, guavas, mangos, papayas, etc.